Operating furniture - Everything you need, but not visible. Everything you need, but not visible. The furniture designed for the needs of the dental surgery. Maximum cleanliness, aesthetics and functionality. Operating efficiency is the result of planning and related organisation. A modern dental surgery must enhance its operating efficiency to reduce costs and waste. Smart Trolleys make a real contribution to this. Designed by taking the surgery into account, they transform the furniture, from containers to devices. The patient, when asked to sit in the operating areas, should be in a very neat, clean space. He needs to feel, right from the start, that he is in a facility in which he is the centre of its objectives. Nothing should be visible, but everything should be ready for use. Smart Trolleys are a component of an integrated system that starts from the analysis of the clinical needs of each operating area to define the trolley type and the line composition. It is completely up to you! Each space must be designed according to a logic of functionality. Think of working needs and do not compromise, as Smart Trolleys can adapt to them. Set them up as necessary. Each operating area, regardless of its intended use, needs to provide the operator with a series of commonly used equipment, materials and instruments. In short, everything that is repeatedly needed, regardless of the intended use of the operating space, must be at hand. Everything has its place in the Trolley. In the intraoperative period, when not in use, everything remains inside out of sight. When it is in use, i.e. when removed from its box, it becomes an indispensable tool. The quantity of the electromedical instruments that the dental staff use during dental procedures is highly important. Continuous technological development and new clinical procedures lead to the introduction of new devices. Unfortunately, every electromedical device features handpieces, cords, pedals and power supply cables. All this causes disorder, confusion, difficulty in sanitisation and a consequent negative impression on the part of the patient. The solution is Smart Trolley Electromedical which, with its centralised power supply system, modularity, the accommodation of bulky pedal commands becomes an indispensable organisational and functional element. In addition, as it can be fitted with a handpiece holder table and a drip pole holder, it becomes the perfect surgical cart, making everything available to the operator in the operating context, while keeping all the wiring and devices connected to it when at rest out of sight. During a dental procedure, the staff work around the patient. The instruments used, the disposable equipment and any waste products accumulate on the support surfaces of the surgery. This action, although controlled, increases the risk of cross-contamination, but above all makes the layout and sanitisation of the operating area less efficient and more costly in terms of time between one patient and the next. To reduce the time and rationalise the management of waste and contaminated material, the Postoperative Smart Trolley has been developed. With its built-in decontamination tank and recycling compartments, it is a hub for the collection and sorting of infected material. The Postoperative Smart Trolley significantly reduces the time needed to reorganise the surgery between patients. 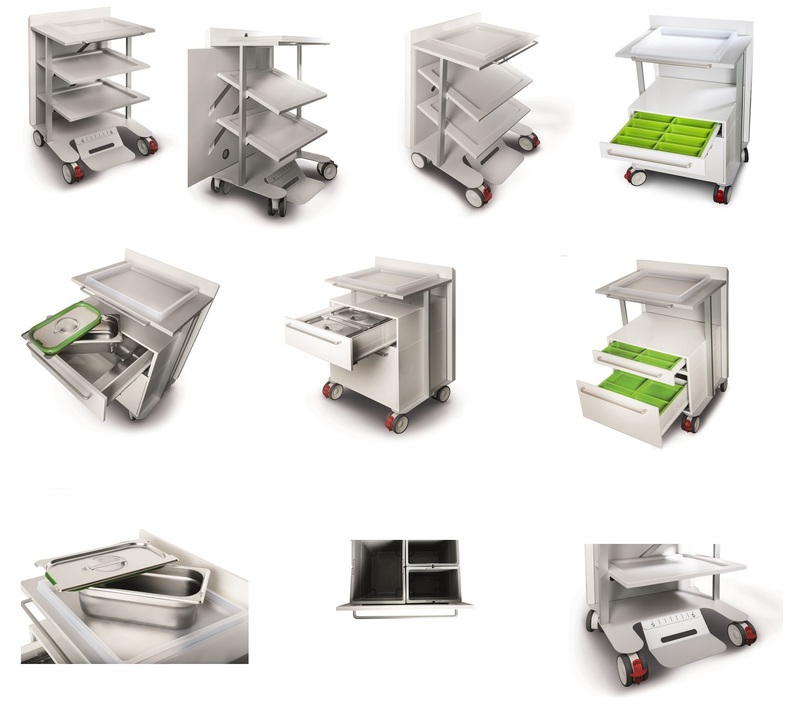 Thanks to its modular construction, the Smart Trolley adapts to the operator's needs and allows the creation of a combination of shelves, drawers and accessories, ideal for every personal way of working.